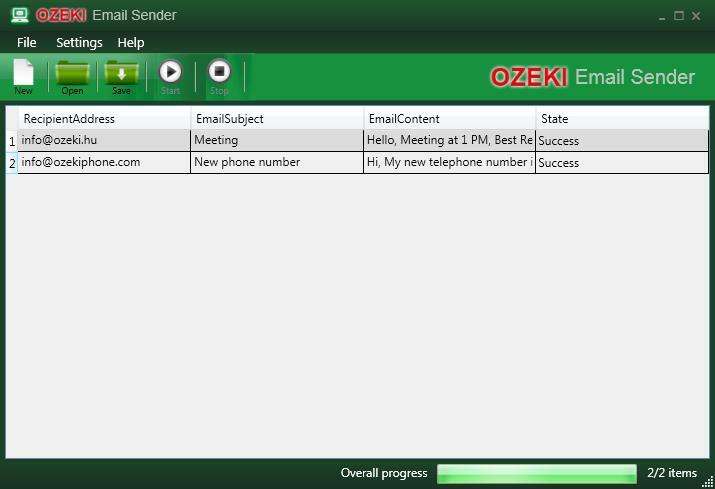 Ozeki Broadcast By Email integrates an intelligent, automated e-mail sending solution into your communication system. After you have sent your customised text e-mails, you can easily track the status of your messages. This way, you can manage your email traffic efficiently. Create a CSV file filled out the table with user data (RecipientAddress, EmailSubject, EmailContent) then import your existing mail list. If you need you can easily modify the subject and the text in each line. Click on 'Start' button to send your email. Check what percentage of your messages were delivered and undelivered. You can see the messages in progress as well. Ozeki Broadcast By Email provides great opportunity to reach employees, customers or any other partners in a personally and direct way. This software can be used to spectacular email marketing, stakeholder communication and efficient notifications.